York Teaching Hospital NHS Foundation Trust has an ambitious programme of service modernisation and a reputation for providing high quality services. In line with our outlook, we are now inviting applications for this post, at Scarborough Hospital. 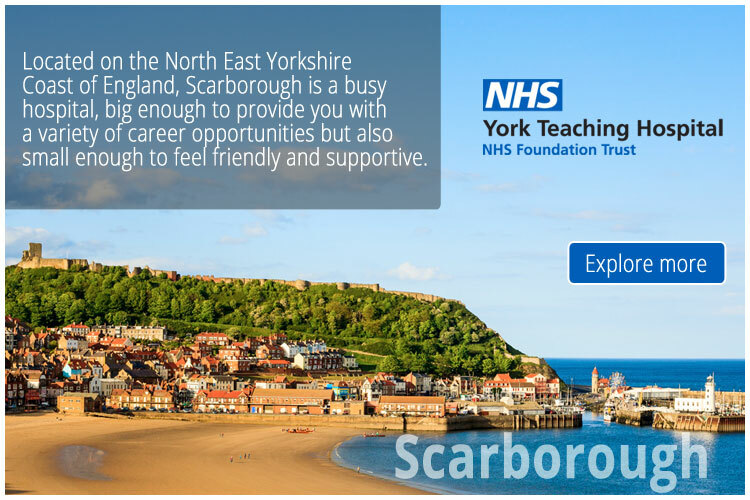 Please note that the Job description states York Hospital but this particular post is based in Scarborough. This is a service post, however, good training and teaching facilities are available within the departments and in the Postgraduate Medical Centre based at the Hospital. The need for the successful candidate to attend clinical and generic skills training will be dependent on the individuals’ needs. The successful post holder will work at SpR level and join the Diabetes & Endocrine medical team at Scarborough Hospital. The Post holder will be competent in General Medicine and engage in all the duties incumbent in that role. The hospital offers a friendly and welcoming atmosphere with an excellent record of support for Trust Grade Doctors. Scarborough is situated on the beautiful North sea coastline with access to both countryside and coastal activities. The City of York is a busy tourist and industrial centre and is just 40 miles away. NB. We reserve the right to close this vacancy early if we receive a high volume of applicants. Therefore please apply early to avoid any disappointment. This post has become available due to a gap on the training programme, if the Trust is later informed by the deanery that the gap will remain, successful post holders may offered an extension to contract, although this may not be guaranteed and is dependent on our allocation of trainees from the deanery.